Sub-hunting patrol planes from bases in Japan are also participating in the joint naval exercise dubbed "Malabar". Okinawa, Japan: A Chinese observation ship shadowed the powerful U.S. aircraft carrier, John C. Stennis, in the Western Pacific on Wednesday, a Japanese official said, joining warships from Japan and India in drills close to waters Beijing considers its backyard. The show of American naval power comes as Japan and the United States worry Beijing will look to extend its influence into the Western Pacific with submarines and surface vessels as it pushes its territorial claims in the neighbouring South China Sea. 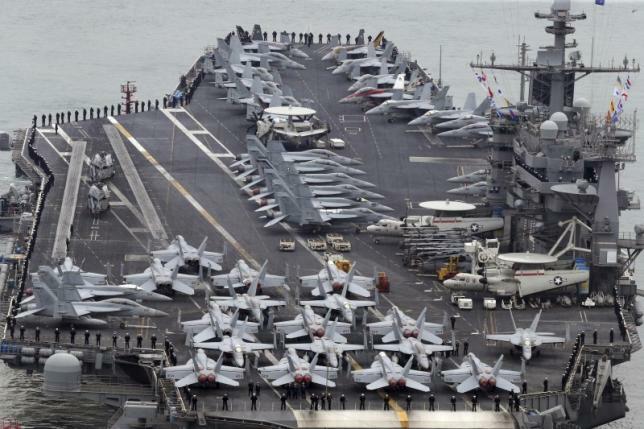 The 100,000 ton USS Stennis, which carries F-18 fighter jets, joined nine other naval ships including a Japanese helicopter carrier and Indian frigates in seas off the Japanese Okinawan island chain. Sub-hunting patrol planes launched from bases in Japan are also participating in the joint annual exercise dubbed "Malabar". The Stennis, which has been followed by the Chinese ship since patrolling in the South China Sea, will sail apart from the other ships, acting as a "decoy" to draw it away from the eight-day naval exercise, a Japanese Maritime Self Defense Force officer said, declining to be identified because he was not authorized to talk to the media. Blocking China's unfettered access to the Western Pacific are the 200 islands stretching from Japan's main islands through the East China Sea to within 100 kilometers of Taiwan. Japan is fortifying those islands with radar stations and anti-ship missile batteries. By joining the drill, Japan is deepening alliances it hopes will help counter growing Chinese power. Tensions between Beijing and Tokyo recently jumped after a Chinese warship for the first time sailed within 24 miles (38 km) of contested islands in the East China Sea. For India, the gathering is an chance to put on a show of force close to China's eastern seaboard and signal its displeasure at increased Chinese naval activity in the Indian Ocean. India sent its naval contingent of four ships on a tour through the South China Sea with stops in the Philippines and Vietnam on their way to the exercise.